Stacey Abrams fights voter suppression. The media ignores the issue. Photo credit: DonkeyHotey / WhoWhatWhy (CC BY-SA 2.0). See complete attribution below. Despite the untold millions that corporate media spends each election cycle, and the thousands of reporters the big news outlets dispatch to cover races across the country, it is truly baffling that, without fail, they miss one of the biggest stories: the impact voter suppression has on the outcome. What is even more stunning is that this impact has become more pronounced since the 2013 Supreme Court Shelby County v. Holder decision opened the door for states with a history of discrimination to return their election laws back to the Jim Crow era. There were lots of really close races this year, and it’s more than likely that voter suppression was the decisive factor in many of them. But you wouldn’t know that from the corporate media, which hardly discussed the issue before the election (and even that was an improvement over previous years) but then completely ignored it once the ballots had been cast. It’s like covering the Super Bowl without ever mentioning that one team had an extra player on the field the entire time and the referees never threw a flag — as though that had no impact on the outcome. So how come data journalists like Nate Silver can tell us down to the 18th decimal point what percentage of 25-year-old female vegan college graduates making $58,000 per year are supporting Democrats but can’t even hazard a guess on the devastating impact of purging voter rolls, rejecting voter registrations, or eliminating polling locations? And why isn’t there a category in exit polls for people who wanted to vote but didn’t get to cast a ballot for any number of reasons? We know that thousands of eligible voters are turned away each election or never make it into the polling places because the lines were too long. Yet the news organizations with the means of getting an approximate number of Americans disenfranchised in this way are not doing it. That is a huge disservice to democracy and a dereliction of duty on the part of the media. Being able to say how many people are turned away or give up — and who these people are — would be invaluable to prove the effect of voter suppression and to put an end to it. But nobody is even trying to do that. Even though voter suppression policies target their core constituencies, Democrats aren’t helping. While Republicans cry “voter fraud” with no evidence in any close election, Democrats are often hesitant to point to the very real problem of voter suppression as a factor in the outcome. That is why it is so refreshing to see what Stacey Abrams is doing in Georgia. When the dust had settled on the state’s gubernatorial race, she was just a few thousand votes away from forcing a runoff — even though her opponent Brian Kemp had spent the past eight years as secretary of state stacking the deck in his favor. Any news outlet following the race — and WhoWhatWhy followed more closely than anybody else — knows that the outcome of a fair election would have been different, but that fact did not feature prominently in the coverage of the corporate media. Unlike other Democrats, Abrams is fighting back. While she acknowledged that she lost an (albeit very unfair) election and is not challenging the final tally, she is now battling back against a system that clearly and methodically disadvantages people of color. Her new group, Fair Fight Action, filed a far-reaching lawsuit in Georgia this week to force the state to hold transparent and non-discriminatory elections. Abrams’s approach is laudable but she cannot do it alone. Nor should she. It also shouldn’t be up to election-integrity activists, who are currently doing most of the work to make US elections fair. The subversion of democracy, in particular since 2013, is a national crisis and the corporate media must finally address it. This is, or at least should not be, a partisan issue. Because it raises a fundamental question that goes to the heart of the US Constitution: Should elections be a cynical game in which winning justifies any dirty tricks or should all eligible Americans have an equal opportunity to vote for the leaders of their choice? 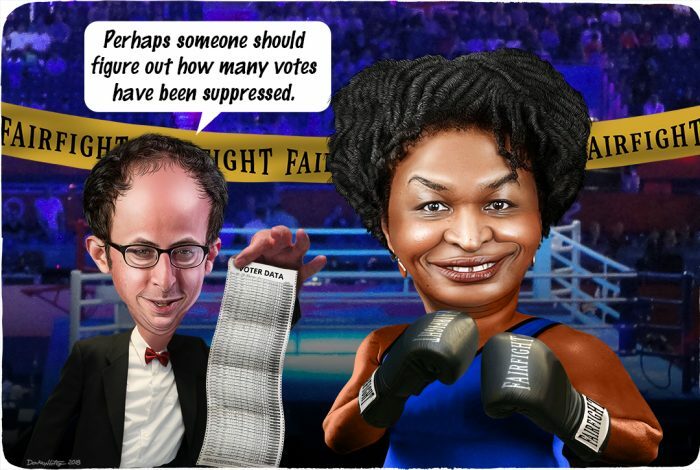 The cartoon above was created by DonkeyHotey for WhoWhatWhy from these images: Stacey Abrams caricature (DonkeyHotey / Flickr – CC BY 2.0), Nate Silver caricature (DonkeyHotey / Flickr – CC BY 2.0), arena (sachab / Flickr – CC BY 2.0), boxer (US Army), and boxing gloves (US Army). Related front page panorama photo credit: Adapted by WhoWhatWhy from ballot box (mb7art / Flickr – CC BY-NC-ND 2.0).